After Night Falls is the perfect crime-themed slot machine, with the storyline following a Detective who is hot on the trail of a serial Criminal that has been breaking into apartments and stealing goods. As with all 3D slot machines from Betsoft Gaming, After Night Falls features incredible graphics with both the Detective and Criminal characters fully animated on the reels in 3D, as well as several exciting and very rewarding bonus features. 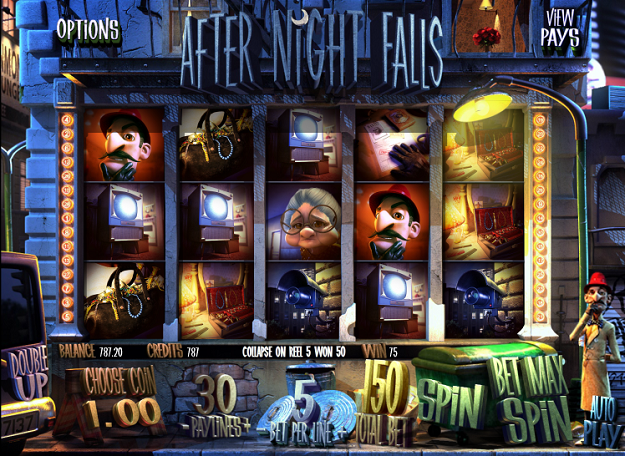 There is actually a total of five different bonus features in After Night Falls including instant-wins, free spins, moving wilds, stacked symbols, and of course a second screen bonus game which is fully interactive! Visit www.DrakeCasino.eu to play After Night Falls now! Just like the majority of 3D slot machines developed by Betsoft Gaming, After Night Falls contains 5 reels and 30 paylines. The coin denominations available are 0.02, 0.05, 0.10, 0.25, 0.50, and 1, plus you can bet between 1 and 5 coins each line – meaning you can bet up to a maximum of $150 each and every spin. One of the biggest attractions of playing After Night Falls is that there is a mammoth max win of 1,550,000 credits available – which is one of the highest payouts available from Betsoft games, with the norm being a few hundred thousand in most of their 3D slots. Betsoft Gaming always do an exceptional job of designing each slot interface and it’s symbols to integrate into the theme of each game they create, and that is exactly the case in After Night Falls too. It is set outside an apartment block with the 3D Detective situated on the right side of the reels performing numerous actions such as using his magnifying glass, meanwhile the Criminal pops up on the left side of the reels behind a van trying to stay out of sight. The symbols you will find in After Night Falls are: Detective, a cat, jewellery box, CCTV camera, television, bag of stolen jewellery, Detective’s desk (triggers free spins), magnifying glass (moving wilds feature), the Criminal (triggers 5 Rooms Click Me feature), and the Granny symbol (which triggers the bonus round). The highest paying symbol is the Detective and should you land five of them on the reels at one time you will be rewarded with 1,250 credits. The fact that there are no playing card symbols means you will hit bigger wins and bonus features much more frequently. Moving Wilds – The Magnifying Glass is the Wild symbol in After Night Falls and should you land it anywhere on the reels it will become a ‘moving wild’. It provides you with free spins for the duration it is on the reels, moving from right to left, disappearing after one final free spin when it is on the very first reel. Despite being Wild, it doesn’t help activate the remaining bonus features listed below – but it is still a very rewarding feature. 5 Rooms Click Me – This is an instant-win feature which begins when you land three or more symbols of the Criminal anywhere on the reels. You are then taken to a new screen where you are presented with five different apartment doors. Your task is to select a door for the Criminal to enter and rob the apartment (which earns you credits) and you can continue opening more doors until you open the one with the word ‘collect’ which then ends the feature. Collapsing Stacked Symbols – When you spin the reels and a whole reel contains the same symbol it will then collapse, leaving one of the symbols on the bottom, with new two symbols falling into place instead. This feature automatically triggers a 3x win plus the new symbols can contribute to extra wins, however you should note that this feature can only be triggered in After Night Falls if you are playing on the maximum 30 lines. Free Spins – The Scatter symbol in After Night Falls is the detectives desk icon which shows the burglars case file and it is used to trigger the free spins mode. The number of free spins you get is dependent on the number of Scatter symbols you land anywhere on the reels at one time. Should you land two you will win 60 credits, three will reward you with 10 free spins, four rewards you with 15 free spins, and five rewards you with a mammoth 25 free spins. On top of this there is a random multiplier worth 2x-10x attached to all wins. Investigate Bonus Round – This second screen bonus feature is activated by landing three or more Granny symbols on the reels. The scenario is that Granny’s house has been broken into and your job is to help the detective by selecting areas for him to search, with credits awarded for all the clues you manage to find.